What did God promise to give Abraham and Sarah? "Peace on earth, good will toward men?" Apparently not, according to the 66% of Americans who believe that lasting peace will not be found in their lifetime. As 1976 draws to a close, the dream of permanent peace seems as elusive as ever. Yet there is a solution, and it's one in which you can have a part. "Peace on earth, good will toward men?" Apparently not, according to the 66% of Americans who believe that lasting peace will not be found in their lifetime. 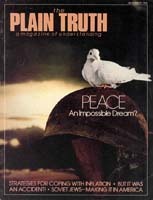 As 1976 draws to a close, the dream of permanent peace seems as elusive as ever. Yet there is a solution, and it's one in which you can have a part. The United States IS at peace. There are no American soldiers fighting in the troubled Middle East. U.S. army units are not involved in the bloody riots and guerrilla warfare that is escalating in Rhodesia and South Africa. And in Northern Ireland, Catholics and Protestants are quite content to fight out their long-standing hatreds without the assistance of U.S. troops.